Music classes provide important opportunities for young children to learn the elements of music, discover how to make their own music, and bring glory and honor to God through their music and musical choices. Because movement is imperative to the understanding of musical concepts for young children, early childhood music lessons utilize a variety of activities and games to teach concepts such as beat, rhythm, pitch, form, and expressive elements. Our curriculum incorporates the finest selection of folk and classical music from around the world, as well traditional and contemporary Christian music. The music curriculum in both grammar and early logic school is enhanced by grade level program performances during the year, as well as field trips to various performances such as the symphony and the ballet. 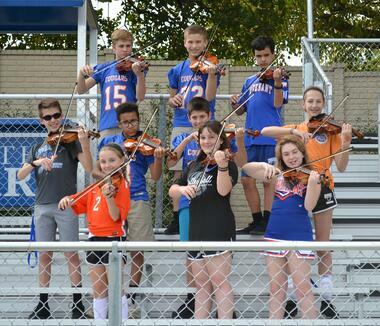 Students in 4th-6th grades may choose to take General Music or Beginning Strings. Students experience what it means to be part of an ensemble and develop more independence as a musician. Cougar Boys Choir and Bel Canto Singers are entry-level choirs for 7th and 8th grade boys and girls. Throughout the course of the year, students will develop their vocal skills and will concentrate on quality choral literature, basic music reading skills, proper vocal production, musical expression, and performance opportunities. Both choirs will perform several times a year in a concert setting and also participate in Choir Festivals. The Logic School Worship Ensemble is an audition group designed to grow the gifts and talents of vocalists and instrumentalists who desire to serve as worship leaders in the chapel services each week. This class focuses not only musical preparation, but also on the biblical principles of Worship and prepares students to lead contemporary worship. Offered on alternating years, Music and Film Appreciation are survey courses designed to develop within each student the skills necessary to be able to better understand and appreciate music or films of many different genres. The students study both elements and criticism. An historical overview provides the framework for a survey of musical or film periods and styles. The Logic School String Ensemble is designed to give intermediate level string players more experience playing their instruments within the context of an ensemble. Goals of this course include technical proficiency, playing harmony, listening skills, music reading, and expression. Chorale is a mixed choral group which focuses on quality choral literature, advanced music literacy, proper vocal production, musical expression, and performance opportunities. In addition to several choir concert performances during the year, the group competes in the TAPPS Vocal division contest. Many students also participate in Solo and Ensemble competition and audition for the TPSMEA All- State choir. the Fine Arts Department musical, and the Fine Arts Showcase. The Rhetoric School Worship Ensemble is an audition group designed to grow the gifts and talents of advanced level vocalists and instrumentalists who desire to serve as worship leaders in the chapel services each week. This class focus is on more than musical preparation, but also on the biblical principles of Worship and prepares students to lead contemporary worship.